Well, I’ve survived another year, which is absolutely fantastic. And that means that I have another year to reflect on in my usual New Year’s looking forward/back thing. 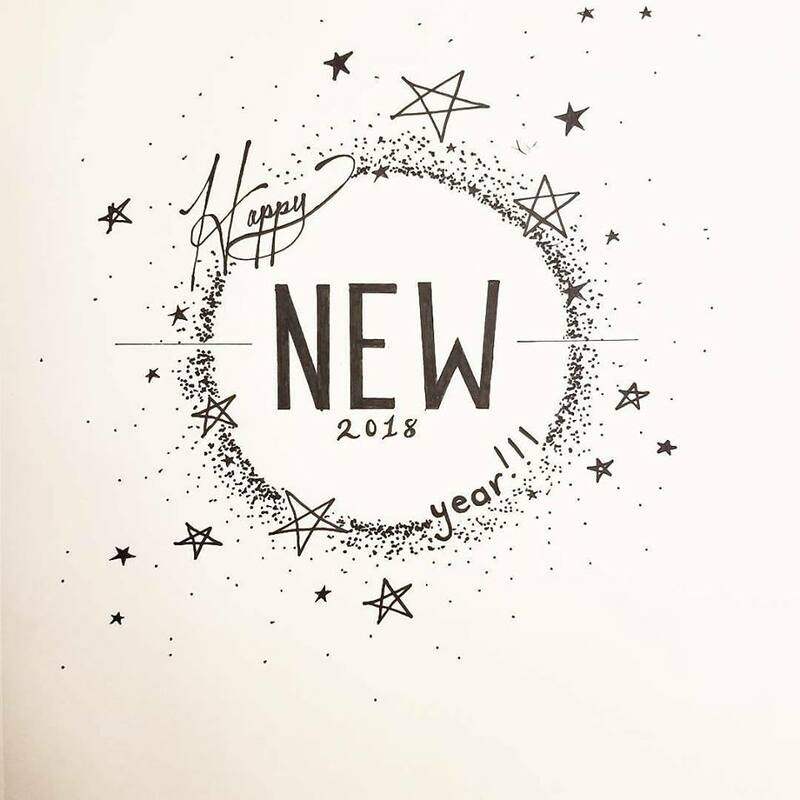 While I don’t think I can truly do the year justice (mostly because I don’t really remember what happened for most of it…), I will mention a few points I’ve been thinking about. Notably good books from this year include: Ninefox Gambit and Raven Stratagem by Yoon Ha Lee, Norse Mythology by Neil Gaiman, Wink Poppy Midnight by April Genevieve Tucholke, Hearts & Other Body Parts by Ira Bloom, Hard-Boiled Wonderland and the End of the World and The Wind-Up Bird Chronicle by Haruki Murakami, Caraval by Stephanie Garber, Warcross by Marie Lu, An Unkindness of Magicians by Kat Howard, and The Graces by Laure Eve. I’ve also met my goal of reading at least one book a month. So thank you, you wonderful books you. I also read a lot of manga this year, more than I probably can mention here, but my top three are Yona of the Dawn by Mizuho Kusanagi, Noragami by Adachitoka, and Fruits Basket by Natsuki Takaya (which I finally finished from when I was a kid.) High recommendations for each of these. I participated in Inktober, which was fun. Also, I’ve been meaning to mention this for a while but I love love love the music composed by Phil Lober. Sountrack to my life. In other music news, however, I think this year most resembles Paramore’s After Laughter album, particularly the first half. I’ve started playing Warframe with my friends. And you guys. It’s so fun. I did not finish my novel. Again. But I think once it’s done, I’ll be so happy. I’m going to actually finish my novel this year. Yes, I know I say this every year. But this time it’s true! I’m also going to try to make more art this year. I could use the practice, haha. There’s a photo comic I’ve been wanting to make for a while… so maybe I’ll make it this year if I find the time. By this time next year I’ll have graduated from college and will hopefully have a job. I am both terrified and excited beyond words. Because of this last fact, I’m actually finding it hard to look into the future… which is unusual. But I shall persevere. And finally, Little Atmospheres: I can’t guarantee I’ll blog more, mostly because my life isn’t too exciting just yet. I may also try to reinstate the 4 x This Week Posts, but again, no guarantees. Well, thank you guys for this year! And here’s hoping for a better 2018. It’s been fun, you guys. I think I’m going back to putting these posts on Monday. Sunday is just a better reflection day for me, so. Can we talk about erasers for a second? Yes, erasers. 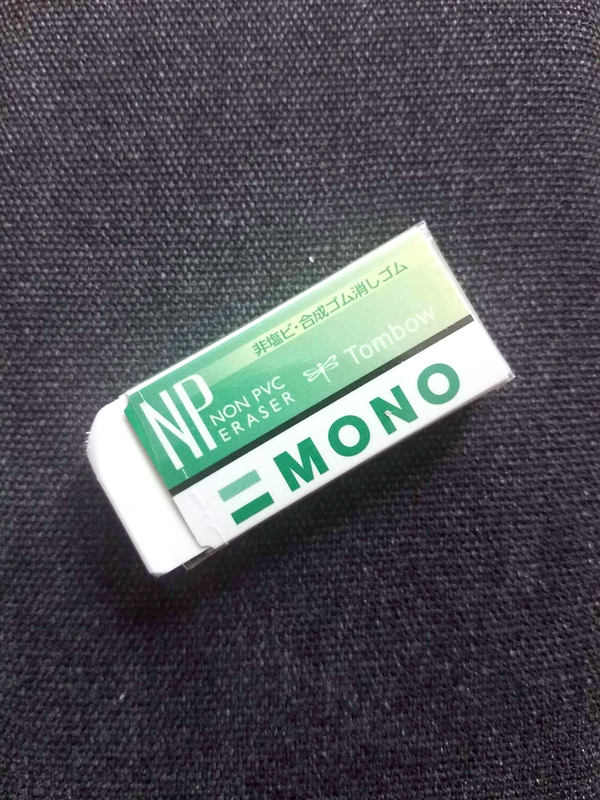 Because I finally caved and bought a Mono eraser on Saturday, and I understand now. I understand. Not that I’ve tried out that many erasers, but it’s hands down the best eraser I’ve ever used. I’ve started drawing for inktober, hence the need for the new eraser (am I supposed to capitalize that? Inktober?) I’ll be putting my drawings up on Instagram and the blog from now on. I’m trying to limit the time I spend drawing to somewhere between thirty minutes to an hour each. Also, my hands are pretty shaky. I forgot about that until I started drawing in ink again. I’m not fond of singing in public, and thus am not the first one to volunteer for karaoke. But it seems fun I guess? Maybe. My friends and family all like it. But anyway, one of said friends asked me once what my go-to karaoke song is. Of course I didn’t really know, ‘cause I don’t sing. But the first few things that popped into my head were Livin’ on a Prayer by Bon Jovi (which is too high for me to sing), My Way by Frank Sinatra (because I know all the words for some reason…?) and In the End by Black Veil Brides (which is… not an option). I’m gonna have to think on that one. Anyway, karaoke has taught me that I also know the words to a lot of old songs. Compared to my peers, anyway. I didn’t buy the book that I mentioned last week, but ended up buying two books by Joseph Cambell (Primitive Mythology and Oriental Mythology) instead. Why, me, why? Back again. And on a Wednesday, no less. And on a school day. Sigh. 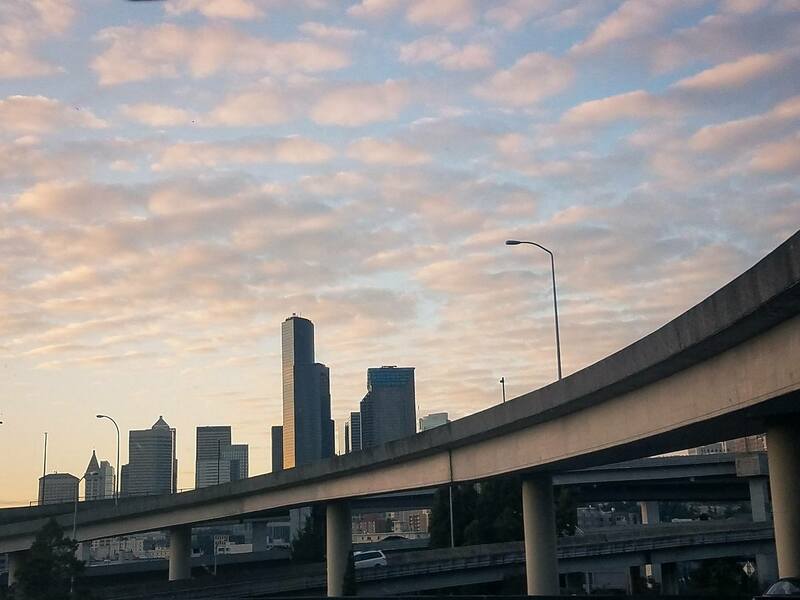 I’m back in Seattle! And I start school today, as I have mentioned earlier. Everything in Washington is so beautiful. Sorry Phoenix. I miss the trees. So… check back with me next week. I might be $25 in the hole by then. I’m thinking about doing inktober this year, which is saying something because I am historically bad at doing these kinds of challenges. Remember the 30-ish day drawing challenge? The one that I never finished? Which was about the same length as the month of October? I keep saying I’m “thinking about it” even though I just bought new drawing pens and markers. You’re such a hypocrite, me. Anyway, we’ll see how this one goes. Earlier I mentioned that I’m back in school, so I thought I’d talk a bit about the future here. I’m going to keep trying to do these 4x posts, though it may drop down to every other week, since school makes me quite busy. Not that anyone cares, probably. These posts reach, like, what, two people? Well, I’ve missed two Mondays now. The first time around I just forgot, and then I got caught up reading a new book, and then yesterday I thought it was Sunday. So, congratulations me. You are completely not on the ball. As such, I’m going to mention eight notable things instead of four. Sorry in advance, this is gonna be a bit long. I read Caraval by Stephanie Garber and I really liked it (which, if you remember, is why I forgot to post.) When I read it I thought it was up my alley, and I’m glad I wasn’t disappointed. Because if I had been disappointed, well, that would have sucked. Anyway, I loved the way the book was written. Apparently the prose bothers some people, but I like that kind of purpley-ness. 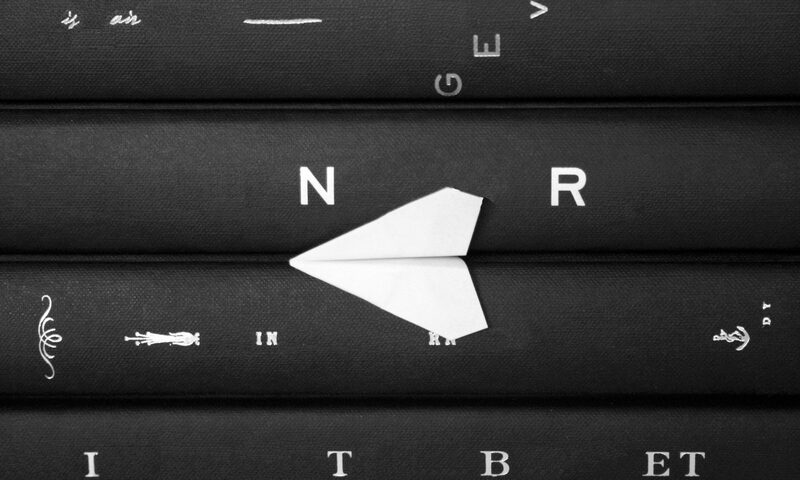 Need a fake language for your book, or just because? Well, a fake language generator exists. It’s called Vulgar, and it’s so much fun to mess around with. At first I thought the sound of Paramore’s newest album After Laughter wasn’t really my thing. But then one day I was listening to it again while doing dishes and reevaluating my life, and suddenly I found the lyrics relevant to my life. Like, eerily relevant. The songs “Pool” and “26” are still my favorite though. Apparently I have a thing about people looking at my laptop screen over my shoulder. Like, whenever someone passes behind me while I’m on my laptop, I feel the need to hide whatever I’m doing and look at a blank tab or something. Even if I’m typing something like this blog post, which will be public anyway, or homework, which is useless for spying. So, for future reference, anybody who reads this and meets me in real life: please do not look at my screen. I beg of you. Times I’ve died inside: x + 1, where x = the number of times the people around me decided to creep up behind me. My laptop has officially stopped recognizing DVDs. I’m crying inside. But the day I replace my laptop (aka MY IRREPLACEABLE LIFE BLOOD) over this is the day I eat my socks. Times I’ve died inside: well, since my laptop is everything essential to my well-being and existence, I’d say about 1,000 times. I decided to take the “Ash challenge” while playing Pokemon Fire Red again. According to the challenge I have to a) only use Pokemon that Ash caught in the anime, b) catch a pikachu as soon as possible and always keep it in my party, and c) give away any Pokemon that are given to me. I’m thinking about not following this last one, though, because I need a Lapras. Sometimes I wish I was really into genre fiction. You know, like I wish I was obsessed with medieval fantasy or something like that, because then I’d have a near-constant stream of like items that make me happy. I watched a few minutes from the live-action Death Note that Netflix released and almost died inside. And not in a good way. I’ll get back to you when I actually finish the movie. If I finish the movie. Times I’ve died inside: you have no idea. And I only saw a few minutes. 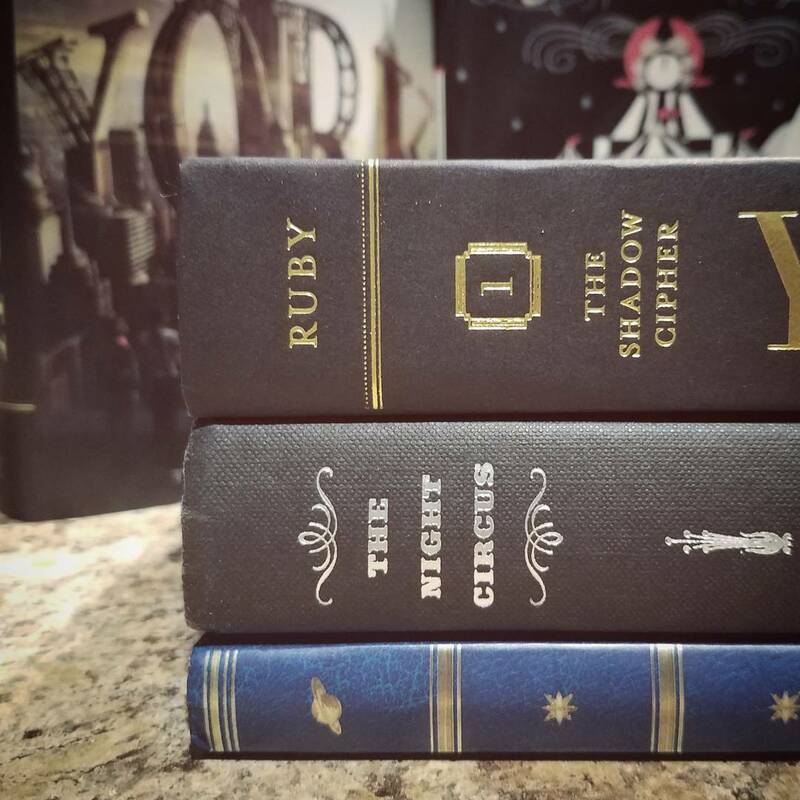 York by Laura Ruby and The Night Cirucs by Erin Morgenstern. One’s an “about time I read this” and the other’s an “about time I reread this.” The last one’s a journal. No significance. She’s only there for aesthetic purposes. This week’s picture I chose because I liked it. No other reason. I haven’t even started reading York yet, but it’s on my list, okay? But just look at that typography. So gorgeous. First off, let’s start with some atmosphere. For the past few days I’ve been listening to jazz-adjacent instrumental music. And by jazz-adjacent, I mean in the realm of “jazzhop” or “jazzy hip hop” or “lounge music,” according to the videos. I dunno, the category of jazz has always been fairly nebulous to me, because one minute you’re at cocktail piano levels, the next you’re nearer to swing, and then maybe smooth jazz, or even ragtime, and those all sound pretty different. Wikipedia has this list of jazz subgenres, in which jazzhop does not appear. Which is kind a sad, because the name jazzhop has grown on me. I’m also really fond of this Studio Ghibli jazz covers collection. Really good for studying/focusing/writing or whatever. And if you’re looking for a new show to watch and you really appreciate this jazzhop vibe, may I recommend an anime called K (sometimes called K Project). Great jazz hop-ish soundtrack, also really like the color tints they add to the animation. Rant. I had a dream a few days ago where an internship that I had applied to (in-dream) called me back and told me I got the job, and it was in L.A., and I went, and I think I was involved in product design, and me and my coworkers made grilled cheese sandwiches in the break room. I woke up once again jobless and without grilled cheese, and so far it’s one of the meanest dreams I’ve ever had. This may be a Pacific Northwest thing, but having stayed in Phoenix for some time now, I have to ask: why no recycling? I feel a bit snotty saying this, but I guess I’m more environmentally-aware than I’d previously thought (or more privileged in that recycling cans in Seattle are everywhere). Let me break it down for you. I a) cannot drink the tap water in Phoenix because it is not 100% savory and is not 100% unquestionable, according to my sister, so I have to b) buy bottled water, whose bottles I c) then have to throw away because d) I cannot find a recycling bin in my sister’s entire apartment complex. It’s official. I have taken recycling for granted. I apologize to the recycling gods for the sheer number of plastic bottles I have sent down the trash chute. I thought I’d share my experience baking salmon. I bake salmon a lot. I love it. Another Pacific Northwest thing, I guess. It’s actually pretty easy and fast, if you can find salmon on the cheap. So here’s how it goes. How to bake a salmon in the oven. First, pick yourself out a good fish. Salmon or steelhead will work. Steelhead is pretty much like salmon only it’s actually classified as a trout. But whatever, still tasty. So, when you go to get your fish, smell it—fresh fish either has no smell or a slightly sweet smell. Fish that smells like fish is old fish. You can also check for freshness by looking at the eyes: clear eyes, fresh fish. You’ll want a good fillet, so the eye thing might not help. But who knows. So now you have this fish. If you’re not gonna use it right away, wrap it in some plastic wrap, then wrap that in foil, and put it in the freezer, then defrost it whenever you want to use it. Otherwise, take the fillet and rinse it with some cold water. Just let some sink water run over it, then pat it dry with a paper towel. Get a baking sheet and line it with foil. It makes cleanup easier. Put a drizzle of oil on the foil-lined sheet and spread it around for a thin layer. Then put the salmon on the sheet, skin-side down. Get some more olive oil, and cover the whole salmon. Make sure it’s entirely covered, you’ll probably have to use your hands to rub the oil around. Once that’s done, seasoning. Usually I just stick to salt, pepper, and some paprika for fanciness. One trick, though: for even more fanciness, sub out the salt for some smoked sea salt. It makes it taste a little bit more like you grilled it on an open fire, even though you clearly did not. Okay, now the oven. 425 degrees for 15 minutes usually does it for one whole salmon fillet. Once time’s up, you’ll want to check the salmon by taking a knife and sticking it in the thickest part of the fish. The knife should go through easy, and when you look inside the cut, the meat should be opaque, and not translucent like the way raw salmon usually is. That’s pretty much it. If you’re a lemon-and-salmon type of person, I would advise against baking the salmon with lemons on top. While it looks pro, baking lemons makes the lemons (and thus the fish) kinda bitter, so I’m not totally in love with the idea. Try just squeezing some fresh lemon instead. Aaaaand you’re done! Easy peasy salmon. If you’ve got leftovers you can save them, or you can mash up the salmon with some cream cheese + mayonnaise + maybe more salt to make a salmon dip. Maybe throw in some onion powder. Chives. It’s good with chips, or on a bagel. Perfection in a bowl. Noodle soup from the Silk Road Noodle Bar. Not sure what it’s called, but it’s number A1. I’m changing up the numbering style for this post, maybe this’ll be better? Also I realize that I’m just ripping all of my pictures straight off my instagram account. Oh well. I’ll try to give you more original material next week. Right now (well, before I took a break to write out this post) I’m listening to/singing Bohemian Rhapsody while sitting on my living room couch, writing. The lights in this room are out. But not for atmosphere, no. It’s because the light switch is broken *cry*. So far, I’ve written about five lines of text. This is my Sunday. I saw my friends in Seattle! I missed them so much, even though it’s only been like a month since I’ve last seen them. 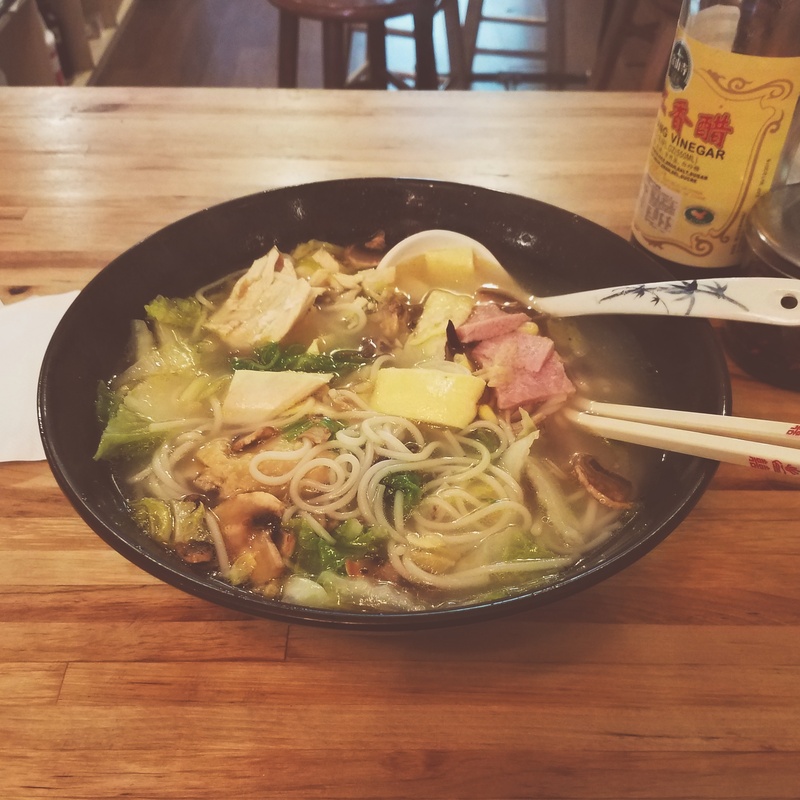 Instead of making a depressing comment about how I’m sad to be back in my home town of Washougal (near Vancouver– not the Canada–and across the river from Portland– not the Maine), I’m gonna recommend some food places I went to this week. Silk Road Noodle Bar. For some reason I always end up going there at like 4:00 p.m. when it’s empty. Like, really empty. But you should get whatever noodle soup A1 is (I can’t remember the name, just the number). It is all I have ever wanted in a noodle soup. Portage Bay Cafe: Breakfast. Yum. I’ve only been there the one time, but omigosh it was delicious. On my hell no list: caffeine and zombie apocalypse movies. I have indulged in both this week and have realized my mistake. Caffeine affects my system pretty badly, and mixed with my anxiety it feels pretty much like a race to death. Heart pounding. Hands shaking. Paranoia, paranoia, paranoia. One sunny afternoon I decided I would drink a white mocha (which I’ve had before, by the way), but there was a bit more caffeine in this one, and I was jittery for hours afterwards. But, like, I like the smell of coffee. And the taste is good at times. But coffee does not like me. So warning to my future self: never again. Now, zombie apocalypse movies. I have always hated them. And always will. I watched one with some friends on the Fourth of July, thinking that it can’t be that bad. This movie that I watched ticked off three of these four items. And no, it did not include deep outer space. Anyway, it was a bad idea. At first I thought it just made me more depressed and uncomfortable, but then I realized it actually scared me. Like actually scared me. It’s been five days and I’m still having horror flashbacks. Again, warning to my future self: NEVER AGAIN. I started reading Emma by Jane Austen this week. So far, I like it. From Austen I’ve only read Pride and Prejudice (one of my favorite books) and Persuasion. Some time ago I read that P&P, Persuasion, and Emma are the three essentials from Austen, but a quick internet search tells me that that might not be the truth. Thoughts on Austen, anyone? That’s all, I think. Man, I want some noodles now. Books! I kinda talked about this on instagram, but here it is again. It’s summer, and I usually read more in the summer, and I haven’t talked about books in a while, so this post was a long time coming. In the order presented in the picture above, first we have Ninefox Gambit by Yoon Ha Lee is one of my favorite books of all time, and I highly recommend it. Smart, overpowered characters for the win! I’m super excited to read the sequel Raven Stratagem, which I just got my hands on. It feels like I’ve been waiting for it forever. I recently finished Hard-Boiled Wonderland and the End of the World by Haruki Murakami. I read it because I a) heard that some people whose work I admire cited this as one of their favorite books and b) made a deal with myself to read more Murakami/magic realism in general. I liked it, but I also feel like I missed something about it. Probably/definitely needs a reread. Also, the shadow was my favorite. 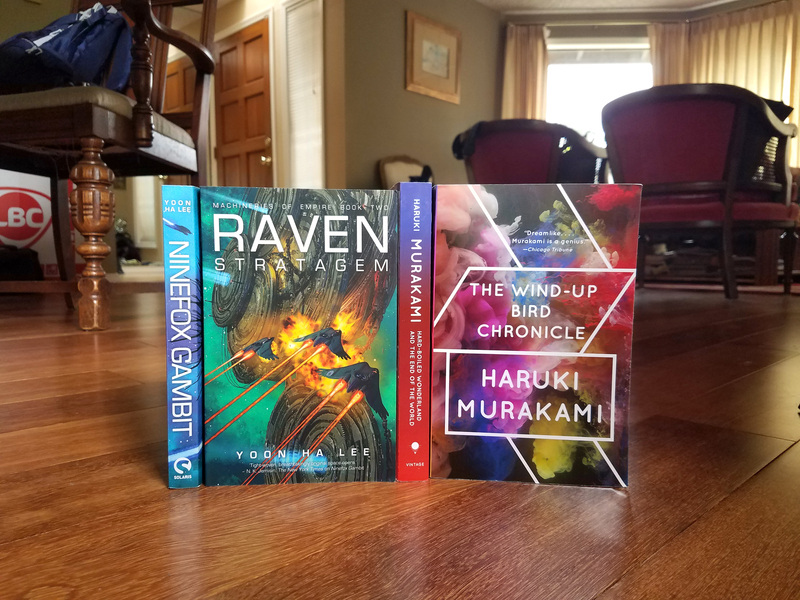 Speaking of Murakami books, I actually started The Wind-Up Bird Chronicle before Hard-Boiled Wonderland, and am about a quarter of the way through. Wind-Up Bird has one of my favorite covers of all the books I own. The book itself is a bit long, but I hear it’s worth it. On the writing side of things: I decided this week to switch from past tense to present tense, which is, uh, harder than I thought it was going to be. Originally my story was 1st person past tense, then I switched it over to 3rd person past, and now it’s gonna be 3rd person present. The flow of words is all messy now, and rereading my work is making me realize that the plot needs some major edits. I’m a bit stuck, but I think I can fix it. Probably. Maybe. 50/50. I am a giant ball of stress right now and feel unmotivated to do anything, which is bad bad bad. Between unnecessary pressure from my parents, a grim future outlook, fluctuating anxiety levels, a stomach that won’t cooperate with me and self-confidence at all time lows, I don’t know how I haven’t had an attack yet. But it’s whatever, I guess. I know this is another hump I have to get over, but it kinda feels like I’m gonna be climbing over this hump forever, Sisyphus-style. See broken human in #3. The only good thing I can say is that my appetite hasn’t completely crashed yet, and I don’t feel as bad as I do when I’m in the actual pit of anxiety, the way I was in like September-Octoberish of last year. So that’s… good, I guess? Kind of a low bar if that’s what I’m comparing my current state to, though. …but send me away with the words to either Welcome to the Black Parade by My Chemical Romance, In the End by Black Veil Brides, or maybe the sound of Farewell Life by Arn Andersson. All good songs, highly recommend. There are times, when writing, that I love my story. And then there are the times when I forget. It was a week or two ago when I had one of these feelings. 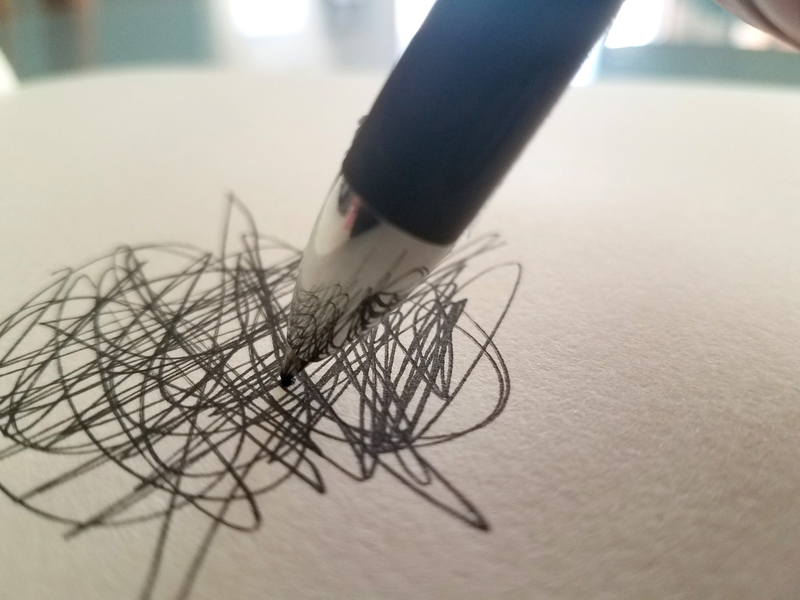 It wasn’t necessarily writer’s block—I knew what I wanted to say, what I wanted to happen next in the narrative, what I had been excited about the week before. But whatever it was, I just wasn’t excited about it now. The feeling is the equivalent of your favorite food being put down in front of you when you are not hungry, or perhaps when you’re sick and can’t eat a lick. My brain registers, Oh, this is my favorite food, but my body rejects it. The same kind of thing happens to me in writing, in reading… in a lot of areas, actually. These things have cycles. Some days I write voraciously. Some days I read so deeply that I forget that I’m sitting in a chair in my living room. And then, some days, I don’t. Anyway, I was thinking about my writing, and why I didn’t like it like I should. I made revisions, but they weren’t helping much. I knew it wasn’t so much that I had grown tired of my subject, so much as that I was just tired in general. And I wasn’t very excited about what I was writing. So I asked myself some questions: What books had I been excited about before? What books had resonated with me? And what had made them so? Thus begins a self-reflection in my relationship with books. Books have had a profound impact not only on me as a writer, but me as a person—as I’m sure any reader can attest to. But I think that it’s important that I, especially now, look back and see what, exactly, has influenced me. Not sure if this is going to be a proper series of posts or just a one-time thing. Either way, this won’t necessarily be a book review. We all know how those go, for me at least—which is to say, horribly. No, this won’t be a review, but a reflection. More personal in nature, and more random, too. Plus, I haven’t put anything writing- or reading-related on the blog in a while. It’ll be good to get back to that. So now the question remains: what has influenced me? My answer: an ocean the size of a pond. 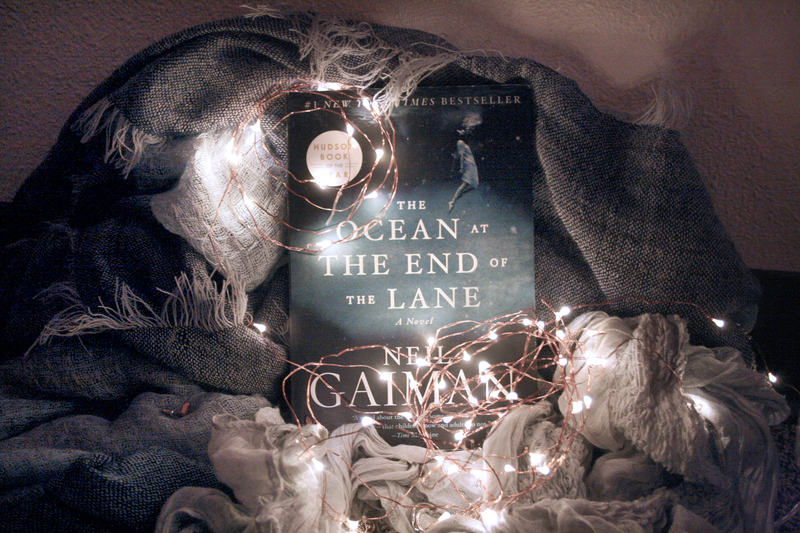 The Ocean at the End of the Lane by Neil Gaiman came to me at just the right time and place in my life, in the summer of 2013 right before my senior year of high school. Had I read it at any other time I think I still would have loved it—but because of where I was at and what things I held to be true in that time, I was able to understand something I’m not sure I could fully grasp before or after. As I sat down to first write this post a few days ago, I wasn’t sure what I wanted to say. I had liked The Ocean at the End of the Lane. It was good. It had left me with a profound, air-light feeling in my stomach after reading it, something only truly great books ever do. But other than those things, I wasn’t sure where to go next. It had, after all, been three years since I’d last read Ocean. I’d forgotten some of the specifics. So over Thanksgiving weekend as I returned home, I scuffled through my stuff, dug up my copy of the book, and reread it. The Ocean at the End of the Lane is about an unnamed main character who goes back to the place of his childhood, and begins to remember things he hadn’t before about when he had lived there. Most of the book takes place in this man’s past, when he is seven. A strange turn of events leads him to become friends with Lettie Hempstock and her family, who have a pond in their back yard that Lettie claims is an ocean. It’s also a story of how he and Lettie confront some pretty dark forces that have come to the neighborhood. There are “superficial” things I like about this book—that is to say, things on the outside I’d probably still like even if my experiences growing up were different (after all, with different experiences, I would probably have related to the book differently.) Neil Gaiman is a master writer. His prose is familiar and magical at the same time. In fact, so are the stories and places he creates. But The Ocean at the End of the Lane holds something specific about me in between its pages—and I think that thing is the memory of childhood. Or, at least, it’s one of them. I suppose I was a storyteller as a child, but not in the way that I think authors usually are. Many established authors can find books they made as kids, written in crayon with random, brief plotlines. The urge to read and write seemed to strike them early, as if they were born knowing and continued to know it. I didn’t think much of either of these until I was probably fourteen. I suppose I’m not an established author, though, so there’s still time to prove this theory correct. I never really wrote as a child. But I imagined. I made up characters and worlds. I had imaginary friends. I knew they were not real in the way that I knew that characters in storybooks were not real, but just like those same storybook characters, my own imaginary ones felt more real to me than anything in my life. They had not existed, but that did not negate the possibility that something like them could exist in the future, or in another place. As a child, everything I discovered was most personally mine. I wasn’t swollen with selfishness, necessarily. But I was the protagonist of my own narrative into which others appeared periodically. Like that Taylor Swift song, my entire world was one block wide but that only made everything bigger. Since my immediate world was so small, and I knew there was more outside of it but not what that outside stuff was, the outside world seemed vast and endless and full of possibilities. In a sense, because the bounds of my inner world were tiny, and because I didn’t know where the outer bounds were, the entire outside world took on a magical quality and became boundless. The conglomerate universe of these worlds was paradoxically small and large at the same time. I’d often look up the street, a place where I’d never gone on my own, and imagine what was past the houses that I’d never seen up close, what lay beyond the trees obscuring the view, how weird it would be to touch the brown paint on a house that seemed very far off. Now, as an adult, I can pretty much guess what’s beyond the houses even if I haven’t been there: it’s more houses. Furthermore, if I want to know for sure what’s over there, I could walk. Drive if I was lazy. Or look it up on the internet. But as a child, it was magic to wonder what was beyond. It was an adventure just to go see, if I ever managed to. I didn’t manage to often. And that’s how it is, isn’t it? As kids we aren’t surprised by the prospect of something more being out there, but we’re still in awe of it. We can believe impossible things, even though we haven’t seen as much as the adults. We aren’t concerned with the bounds. We haven’t seen them, so why can’t they be a million miles away? This is often what I think about when I think on The Ocean at the End of the Lane. The entire book takes place in this one-block-wide kind of place, and yet the book is its own little world, with the unbounded possibility extending the edges. But more than that, it’s also about how these worlds that used to be real to us can—and probably will—be forgotten. Like I mentioned before, of all the books I’ve read, my relationship with my childhood is probably best represented through this one. Not to say that my childhood was close to this—but more that the truths that I knew as a child are truths that I find in Ocean. I remember adults not believing me—not necessarily because either of us was incorrect, but more like we were speaking different languages and it was hard for us to translate. I also remember big battles that my parents didn’t (and couldn’t) know about. Not being able to explain to my parents why I wasn’t hungry. Letting very few into the inner circle of my world. But that summer of 2013 between my junior and senior years I also remember being afraid of losing my world-system. I was, in a way, growing up. Not in the sense that I was learning to be responsible, as many people would say. As a child I was fairly mature, and I think fairly responsible, or as responsible as a child could be. But at seventeen I was losing the very last remnants of my sense of wonder, of boundlessness. I was aware of the real world in ways I wasn’t before. I knew where the edges were, undeniably now. And they were much closer than I’d anticipated. That year and the year after, my world was simultaneously crumbling and being built. I was preparing for STEM careers, and preparing for the tests that led to those careers. I was meditating on college. I was ambushed by what I can categorize now as an anxiety disorder, something I’d never experienced in such force when I was young. My home life was abysmal, and at certain points in time, hopeless. But in that same year I started my first “real” draft of the novel I’ve been working on. My classes were all successes. I was learning compassion, learning to pay better attention to the people around me. I knew with no small certainty that this was the year I’d look back on and see many events that had defined who I was. But I was gaining things at a slower rate than I was losing them, I felt. I was forgetting something I never wanted to. I had been comfortable in the worlds I’d built before. But the world in my head and the world outside were now melding, and I wasn’t sure I liked it. When I read Ocean now, it’s a reminder to me of the worlds I’d forgotten. Much as I hate to admit it, I’m more like the man, attending a funeral forgetting about my past. But reading it then, in high school, I was in the midst of the memory, steeped deep in the middle of the ocean where I knew everything. And I was Lettie Hempstock, in a way, trying to protect something that maybe I couldn’t and later trying to see if it was worth it. I suppose, more than anything, this book is a comfort. It nudges me, reminds me of things I used to know. But it also reminds me that I still know them, deep inside. It has a part of me that I have inadequately tried to describe here. This story is about a child, but the lesson is for adults. What that lesson is, I am still not a hundred percent sure. Perhaps I will not feel this way about this book years or even weeks from now. Perhaps I am over-exaggerating, still high from reaching the end of this wonderful book again. But this is accurate, I think. For now, it’s true. This is me right now. Lots of things are happening in my life, both behind the scenes and on stage. Mostly bad, but eh, what can you do? Some good news is I got a new phone, so my casual pictures are looking a lot nicer. We’re taking a break on the blog from the drawing challenge today (even though it’s been like eleventy-million years since I last drew something for the challenge) so I can mention the state of a few things. Drawing. The drawing challenge is still going on, stuff’s just gotten in the way (I know, I know, shame on me.) Two other design projects have popped up– one logo for a new client and one for a friend– with deadlines, so those kinda have to come first. I’ll try and get back on the challenge schedule this week, maybe discuss the design projects. Books. Summer is when I do the bulk of my reading, since I have more free time then, and the library has reading challenges and so on. Those are fun. I talk about some of these books on the blog occasionally, usually highlighting my favorites. Today I’m mentioning not a book, but a list of books: finally I have complied a loose list of all the books I like on one page, which I’ve put here. Writing. Yeah, I’m still doing that too, even though I haven’t posted about it since eleventy-million x 100000000 years ago. It’s hard to talk about it, though, since I can’t really tell you what it’s about. But anyway, this should be the last draft before peer edits, which I want to start by 2017. Hopefully. Maybe. It’s exciting, but also… daunting. I get the feeling that the story will need to be seriously curtailed. Slash-and-burn type. Kill your darlings, right? I wish you a pleasant day. May you be more productive than I. 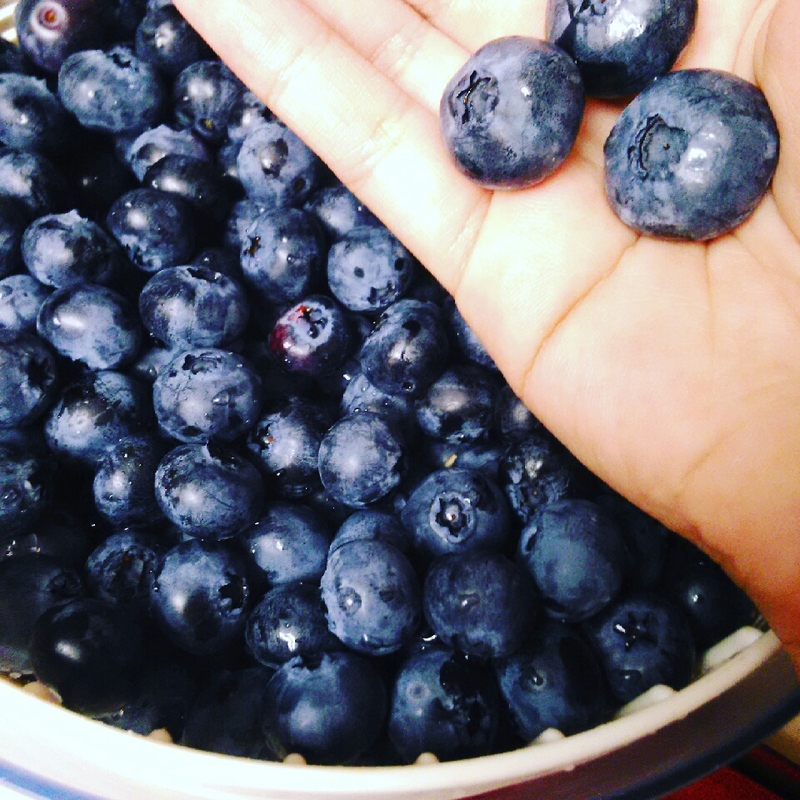 First of all: July is blueberry season and these lovelies are from my backyard. Best blueberries I’ve ever had. July is also Jackie-is-sorry-she-didn’t-post-a-single-thing-in-June month. Apologies. Next week I’m going to try something new, though. Something art-related. Now, we all know that I am terrible at starting projects. And documenting them. Especially during the summer. But I’m gonna do it anyway. Updates soon. Um, I’m on Instagram now too… Yeah, we’ll see how that goes. Instagram feed in the sidebar. I finished it in two-ish days. And I loved Agnieszka! 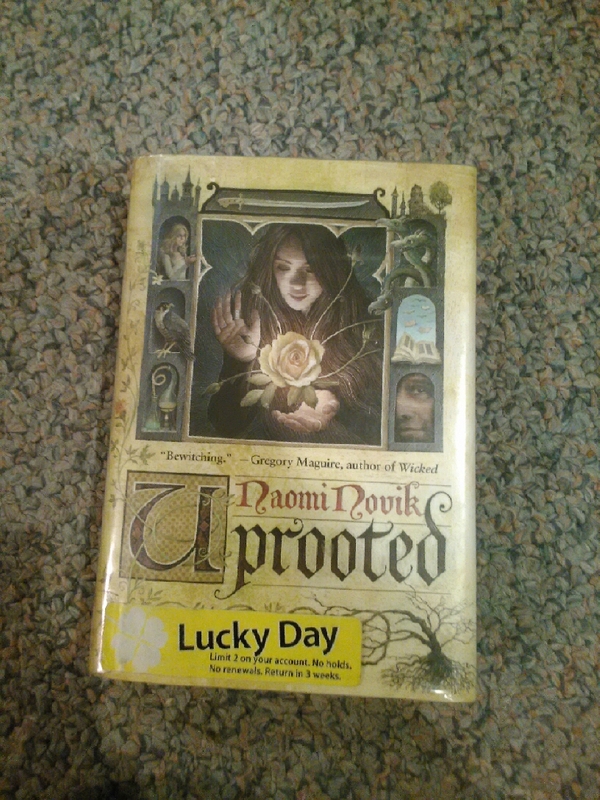 This book was so great and magical. GO FORTH AND READ!